We’ve been experimenting with overnight oats, porridge, and “cereals” for a bit now, and I’m confident to say, this is my favorite combo yet. I don’t like an overly sweetened breakfast. I don’t like sweetened things at any time really, even if it uses “natural” sugars like honey, maple syrup, coconut nectar, etc. They, to me, are still sugar, and are still to be avoided (for the most part). This recipe has all the flavors you find in a usually sweetened dish: cinnamon, touch of ginger, and vanilla. By adding these spices and flavors without adding a sweetener, you are tricking your mind into thinking it is sweet, when really it is just spiced appropriately. 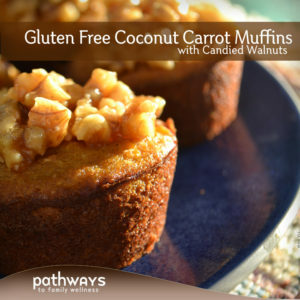 Adding a touch of salt tends to bring out the natural sweetness in the other ingredients like coconut milk, nuts, and grated carrots (yes, there is sweetness there). Once you stop adding sugars, your pallet becomes fine tuned to the natural sweetness in ingredients that don’t have any added sugar at all, and it’s so satisfying to eat. Top it all with some fruit (which has plenty of sugar in it already, but also good fiber and nutrients), and you will never miss the added syrups. 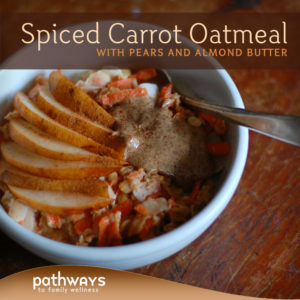 This recipe is great because not only are you getting a healthful grain in to start your day, but you get to have some grated carrot along the way. You can add more oats if you feel you will eat it, but I tend to be quite satisfied with the amount listed below. And with this base you can really play around with any combination. 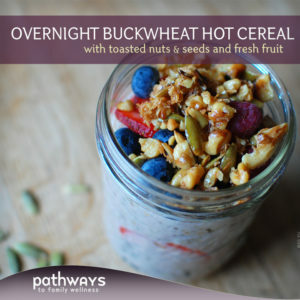 Try adding some seeds or nuts to the overnight process. Top with pomegranate seeds, apples, or even cooked squash (yeah that’s right, it’s delicious). Substitute coconut milk for almond milk, just be sure it is not sweetened. 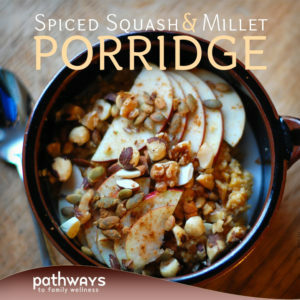 Make it pumpkin spiced by adding a touch of clove and nutmeg and pumpkin puree or sweet potato. The possibilities are endless! Something about winter has me craving comfort food, as I’m sure it does with most people. Our bodies naturally want to be warmer, so I like to feed it warm and satisfying meals, with some vegetable or fruit of course. With this spiced, hearty breakfast, you’ll be looking at oatmeal in a whole new light. Combine oats, carrot, cinnamon, ginger and milk in a jar or other glass container with a lid. Mix, and let sit overnight to soak. In the morning, heat up contents of container in a small pot under low heat for a few minutes. You can also skip this step and eat it room temperature, raw. 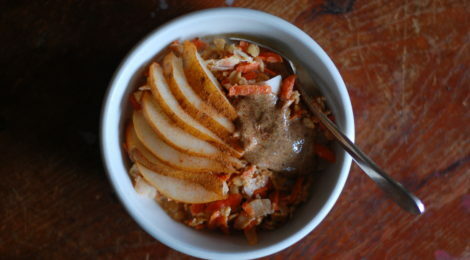 Transfer to a bowl, add more milk or cream and top with sliced pear and almond butter.